Free Airfare to Egypt on Scenic Cruises - Fugazi Travel Agency Inc.
We don’t want you to miss a minute of the fascinating scenery as you cruise the majestic Nile on our exclusive private charter on board Sanctuary Sun Boat III. Catering to just 36 guests, every cabin is tastefully appointed and features a window onto the world for every guest. As part of the 11 Day Treasures of Egypt land tour, our exclusive four night Nile cruise itinerary will take you from Luxor to Aswan, from the architectural marvels of the Valley of the Kings to off-the-beaten-path sights such as the Temple of Hathor at Dendera. 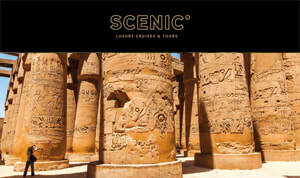 Book now and receive FREE roundtrip airfare to Egypt or $1,000 Scenic Savings per person. Contact Fugazi Travel to book your Nile cruise and escorted tour today! Terms & conditions: Offer applicable to Egypt & Jordan departures from September 2018 – December 2019. Offer valid through August 31, 2018. Free economy air available from the top 25 U.S. Gateways: ATL, BOS, BWI, CLT, CVG, ORD, DFW, DEN, DTW, IAH, LAX, MIA, MSP, EWR, JFK, MCO, PHL, PHX, PIT, RDU, SAN, SFO, SEA, TPA, IAD. Guests have the option to choose their savings: Free Roundtrip Economy Airfare or $1,000/pp Scenic Savings for 10-20 day sailings. A non-refundable initial deposit of $500 per person is required at the time of booking, with full payment required 90 days prior to departure. An additional deposit of $1,500 per person is due at the time of air ticketing. Maximum ticket value per guest for economy air is $1,300 per person. These offers are combinable with groups, past passenger offers, referral offers, travel show & agent training vouchers. Not combinable with National Geographic departures or distressed inventory offers. Valid on new bookings only. Limited availability, not transferable or retroactive and may be withdrawn at any time. Complete terms & conditions available at scenicusa.com.